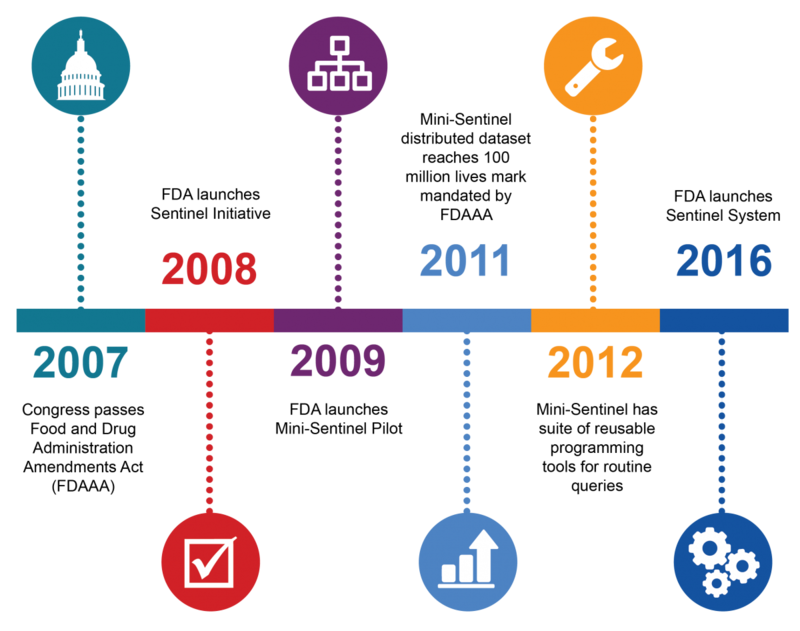 The Sentinel Initiative began in 2008 as a multi-year effort to create a national electronic system for monitoring the performance of FDA-regulated medical products. The Initiative is the FDA’s response to the Food and Drug Administration Amendments Act (FDAAA) requirement that the FDA work with public, academic, and private entities to develop a system to obtain information from existing electronic healthcare data from multiple sources to assess the safety of approved medical products. Sentinel’s work focuses on drugs, vaccines, and other biologics (such as blood products). The Active Postmarket Risk Identification and Analysis (ARIA) system, mandated by FDAAA, enables the Agency to evaluate some safety signals in the postmarket setting more effectively, using Sentinel’s automated tools. FDA is working to refine existing methodologies and develop new and innovative approaches to support safety surveillance, focusing on ways to identify unexpected safety concerns. FDA’s efforts to date have focused on developing Sentinel to serve as a tool for safety surveillance by FDA. The FDA is now actively engaged in promoting synergies and identifying opportunities for broader use of the data infrastructure used by Sentinel for other purposes within the public health arena. The FDA is working with National Institutes of Health Collaboratory Distributed Research Network and the Patient Centered Outcomes Research Network (PCORnet) and others toward this end. Additional information about the Sentinel System and its precursor, Mini-Sentinel, is available in the reports and publications listed below and elsewhere throughout this site. The Sentinel Program Interim Assessment (FY15) and the Sentinel Final Assessment Report (2017) summarize the results of two evaluations that examined the strengths, limitations, and the appropriate use of Sentinel for informing regulatory actions to manage safety issues. The FDA's Sentinel Initiative website describes Sentinel's background, news and events, deliverables from completed contracts, funding opportunities, and ongoing projects.